A new study finds green roofs can absorb 30 percent of the rainfall that land on them, curbing storm water runoff. Photo by Eveliz Vega Marzan. Green roofs are a cost-effective way to reduce storm water runoff, cool the atmosphere and save energy, according to a new study by Stuart Gaffin of Columbia University’s Center for Climate Systems Research. 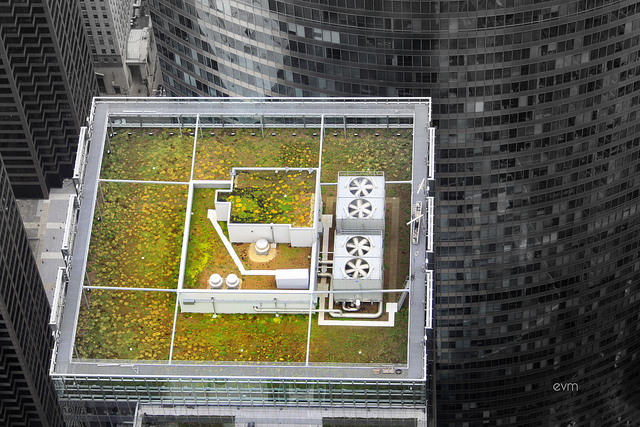 Gaffin measured the amount of energy entering and leaving New York City’s Con Edison Green Roof and found that the roof retains roughly 30 percent of the rainwater that falls on it. The study also found that, with all financial costs considered, it costs the equivalent of two cents per year to capture one gallon of water using green roofs. The mass adoption of cycling in the U.K. will require the advent of comprehensive street and policy changes, a new study says. The study examined four English towns and found that in order for cycling to reach prominence, it will require separated bike lanes of proper width on all main urban roads, as well as a strict liability law. Halophytic perennial grasses hold potential as a biofuel source that doesn’t compete with possible food-producing lands, a new study published in the Journal of Biomass and Bioenergy found. The grasses—biomass easily convertible to good quality ethanol—thrive in saline lands typically unfit for food production. The finding suggests a two-fold bonus, as the grasses give function to lands that might not otherwise be profitable. A memorandum of understanding to conduct research and conferences on creating sustainable cities was signed this week by the Centre for Livable Cities (CLC) and the Urban Land Institute (ULI). ULI is an international not-for-profit organization whose work focuses on land use and real estate, while CLC is a Singapore-based think tank who works on urban development with an emphasis on the role of public-private partnerships. While presenting the new partnership, leaders of the organizations noted the importance of high urban density and considering Singapore’s aging population. Hydrotreated vegetable oils (HVO) outperform woody biomass and transesterified lipids as potential biofuel sources in both the areas of lifecycle analysis and costs, according to a new study. HVOs—generated from waste or biproducts like cooking oil—are in comparatively short supply, and as such, the study recommends woody biomass as the next best option. The findings, published in Energies, are the result of efforts from a Norwegian University of Life Sciences research team.